With a sweep of a paint sprayer, an artist has managed to take a decrepit motel in my Los Angeles neighborhood and turn it into a destination—not by fixing it up, but by temporarily erasing it from the street. 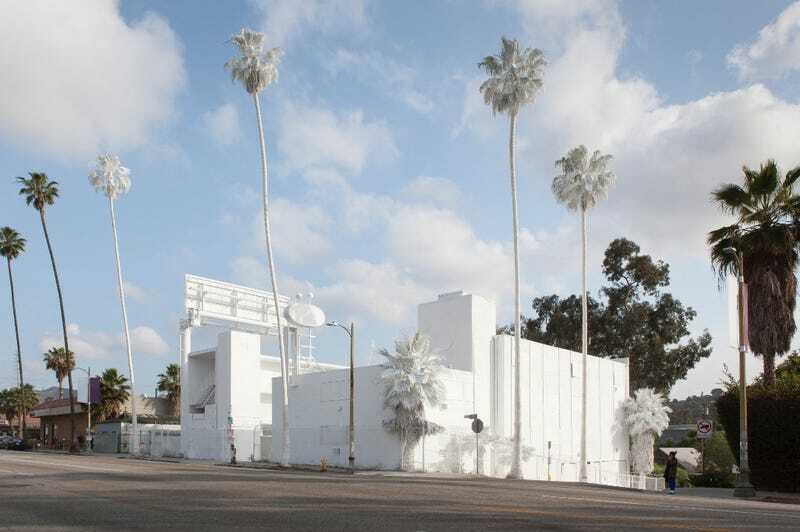 Last week, French artist Vincent Lamouroux used a water-soluble whitewash—no, it’s not actually paint, but more on that in a second—to blanch a motel, including the dozen or so Mexican fan palms that fringe the property. “The idea was to cover the entire building, including the trees,” Lamouroux told me yesterday while he gave me a tour, dressed head to toe in white. In fact, it is the inclusion of the palm trees, swaying overhead like bobblehead ghosts, which has garnered the piece the most attention. They are also the most troublesome, from an artistic standpoint. It’s a challenge to keep anything in LA a pristine white shade, but apparently trees are especially problematic. The wash, applied by sprayers the week before, had already begun to fade, so yesterday a man was positioned atop a cherry picker, hitting them with another coat before the opening this Sunday. As you walk the western edge of the trendy hamlet of Silver Lake on the city’s storied Sunset Boulevard, it’s the palms you see first, as the monotone piece slowly emerges from the contextual beige of strip mall stucco. Actually, first you’ll see dozens of people standing precariously in the middle of four lanes of traffic to Instagram the piece, which is about as social-media ready as a public art piece could possibly be. Although I got to briefly step inside, the property will remain closed to the public—even the razor wire atop the chain link fence was painted white. There’s no signage (although you might catch wind of a hashtag that helps explain the piece), just a security guard. He might serve as a de facto docent, but he also needs to be there due to the property’s history. Projection, as the work is named, could have been staged at any of the city’s derelict motels, really. But Lamouroux—who lived in the neighborhood years ago—had his eye on this one in particular. The Googie-style sign on top reads Sunset Pacific but everyone here calls it the Bates Motel, partly because it’s on the corner of Bates Street, but mostly because this moniker appropriately conveys its freaky Psycho vibes. But it’s also managed to draw plenty of curious speculation about this particular motel’s past—and future. Lamouroux was not able to find anything about the building’s architect, for example, but since the project has been up he has been approached by many people wanting to learn more about the property, or sharing their stories like a woman who said she honeymooned here, when there was even a sparkling pool. And about the palm trees. They do actually have an advocate: Dave Cooper, an arborist who counts over 200 Southern California cities as clients. He was supervising the application of a product called Premium Greenhouse Shading which is often sprayed on citrus trees and other plants to protect them from excessive heat or certain insects. I thought about this as I walked home, brushing a fine mist of lime from my iPhone screen. Even though this installation “closes” May 10, the various surfaces will return to their natural patinas at various rates, peeling back their white shells like a reptile shedding skin. The building itself won’t be returned to its original state for quite some time. And even then, its “original state” isn’t something any of us who live here want to be restored. The motel itself is in limbo, the property purchased by a developer, but with no planned demolition date. And then, in a fate that many residents might consider to be worse than a vacant motel, it’s to be replaced by a bland mid-rise housing development. The obvious Hollywood ending to Lamouroux’s project is that through his art the building gets saved, maybe bought by the Ace, who restore the pool but leave the cool Sunset Pacific sign. But watching as a couple arrive on bikes wearing matching silver outfits and begin to arrange themselves into a photo shoot on a block where no one stopped before, it made me wonder if the whitewashed spectacle shouldn’t stay just the way it is. Vincent Lamouroux, Projection, 2015. Photos by Guillaume Onimus, except where noted. Courtesy of Please Do Not Enter and Vincent Lamouroux.